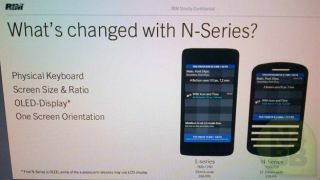 The first BlackBerry 10 device to boast a physical qwerty keyboard will be called the N-Series, according to leaked presentation slides from within RIM. The N4BB site has obtained the documents, which showcase what appears to be a Blackberry 10 version of the incumbent Bold device, previously known as Nevada. According to the slide it'll have a 720x720 OLED display with a pixel density of 330-ppi which translates to a 3.1-inch screen, diagonally. These are the first real details we've heard about the traditional BlackBerry form factor graduating to the new operating system. Assurances have always been there that qwerty keyboards would be part of the line-up, but the company has been focused on the all-touchscreen device, which will be the first to market later this year. Speaking of that handset, it appears, at least internally, that the touchscreen device is called the L-Series (previously known as the London). The leaked slide promises a 1280×768 resolution (the same as the prototype Dev Alpha device) and an OLED display with a whopping 356-pixels-per-inch. That translates to a 4.2-inch display. The L-Series is likely to launch by the end of 2012, while it is hoped that the first N-Series device will be ready for the first quarter of 2013. The big question is, will RIM, in its current form, be around to capitalise?